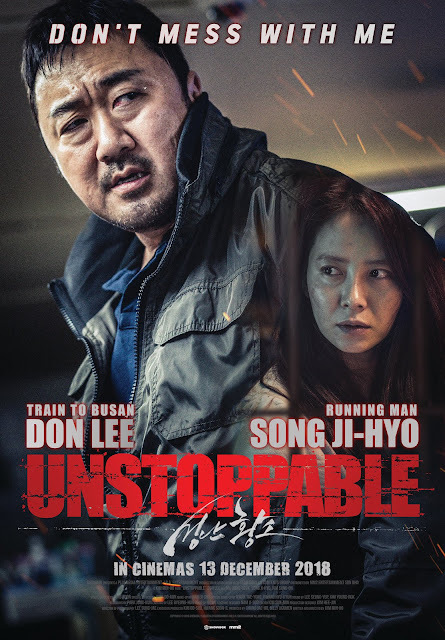 GOKPOP | Exclusive K-News in Malaysia & Singapore: [GIVEAWAY] Action-thriller movie, 'Unstoppable' starring Ma Dong Seok and Song Ji Hyo to premiere in mm2 cinemas on 13 Dec! [GIVEAWAY] Action-thriller movie, 'Unstoppable' starring Ma Dong Seok and Song Ji Hyo to premiere in mm2 cinemas on 13 Dec! mm2 upcoming movie, Unstoppable starring Ma Dong Seok, Song Ji Hyo and Kim Sung Oh is set to premiere in mm2 cinemas on 13 December. In conjunction with its release, mm2 will be having a special screening on 12 December and we will be giving away 10 pairs of Unstoppable special screening passes. Dong-chul (starring Ma Dong-seok) was once a legendary gangster, but he changed his way trying to clean his past and trying to settle down to enjoy an ordinary life with his angelic wife Ji-soo (starring Song Ji-hyo). One day, he returns home to find his home in a mess and his wife is nowhere to be found. Soon after, he receives a call from a stranger offering to pay him to give up his wife. Dong-chul vows to save his kidnapped wife. Dong-chul has an impulsive behaviour and reckless attitude which he will turn into violent temper when he gets angry. However, he has changed after his marriage. One day, he found out his wife went missing and this make him loss rationale. Ji-soo is a righteous and sweet person, wife of Dong-chul. She's the only one that able to change/control's Dong-chul anger.